The finalists for the Med-Tech Innovation award categories, taking place as part of the Medilink UK Healthcare Business awards, have been decided by an independent judging panel. 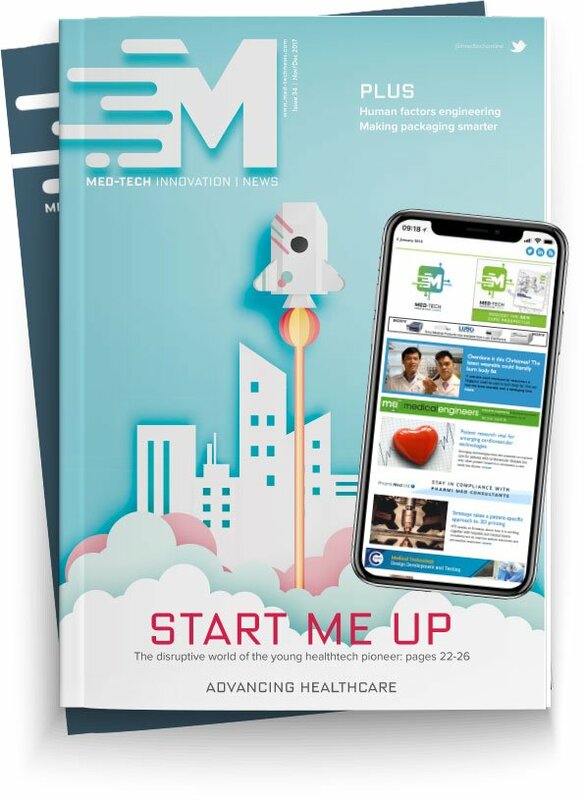 The five new Med-Tech Innovation award categories will sit alongside the Medilink UK categories at this year’s awards and gala dinner, as a representation of engineering excellence and ingenuity across the medtech sector. The winners for each category will be announced on the 15th May at a gala dinner and reception, hosted by award-winning author and comedian, Adam Kay. Awarded to a company which has demonstrated the integration of smart components and technologies in a project with futuristic, digital applications. Entry: Arete Medical Technologies' Respicorder for monitoring respiratory conditions. Entry: Aseptika’s Activ8rlives platform called Asthma+me for children with moderate-to-severe asthmas. Entry: Cambridge Respiratory Innovations' N-Tidal technology platform for consistently and reliably measuring the TBCO2 waveform. Entry: Sensium's discreet, wearable, wireless system for monitoring vital signs of patients outside of high acuity areas. Sentinel Biosensor's medical grade, re-useable, wearable vital signs monitor, which claims to measure more vital signs in a single device than any other. Awarded to a company which has demonstrated and executed an innovative design strategy to meet a clinical need. Entry: BlueThink UK's battery technology which aims to improve the experience of everyone involved in the product life-cycle, from design to final disposal. Entry: Computational Life's testing software which integrates several components of the human body in a tightly integrated manner. Entry: MD-TEC's Sim Lab, which echoes the NHS clinical environment, allowing companies to design products that synergise with the existing clinical infrastructure. Entry: Owen Mumford's Unifine Pentips Plus (UPP), a single use disposable needle for use with re-useable or disposable injection pens. Entry: Sheffield Hallam University's wireless non-invasive respiratory sound recording device, to overcome the challenges in the screening and diagnosis of inducible laryngeal obstruction (ILO) in paediatric patients. Entry: Sutrue's range of devices with “spring-plate” design which helps drive a needle 360°, creating a perfect suture at the touch of a button. Awarded to a company who achieved a breakthrough or improvement in the manufacturing process of a product or component for a life sciences application, through engineering ingenuity and skill. Entry: ES Precision's CO2 laser perforating process which contributes to a better, more comfortable experience for amputees when wearing artificial limbs. Entry: LightOx's device, which is capable of delivering light at a wavelength, for a set period of time, with a set intensity, essentially delivering power to the target in a controlled manner, when developing light-sensitive drugs and devices. Entry: Mitsubishi Electric's innovative, compact thermoforming packaging machine that breaks the rules of conventional packaging lines and reduces the footprint of a medical packaging line by a huge margin. Awarded to a company that can demonstrate the implantation (or the supply) of smart manufacturing techniques to improve the quality and efficiency of product supply. Entry: Connect 2 Cleanrooms' intelligent cleanroom solution, designed for a medical device manufacturing contract that is due to run until 2032. Entry: MasterControl's Manufacturing Excellence solution for medical devices and pharmaceuticals eliminates the inefficient paper-based management of device history records, recipe management, batch records, travellers and other manufacturing information processes, and provides greater automation, visibility and traceability throughout the production life cycle. Entry: Sumitomo Demag's all-electric injection moulding machines, supplied to Trend Technologies' recently opened third ISO Class 7 (10,000) cleanroom in Mullingar, Ireland. Awarded to a company which can demonstrate that materials choice had a direct impact (or the potential to impact) on the clinical benefits of a medical device. Entry: MP+H Packaging's coating that protects medical products from cross-contamination throughout the supply chain. Entry: Nova-BioRubber Green Technologies' novel growing and green processing technologies for the production of hypoallergenic and sustainable biolatex, biorubber and inulin to solve latex allergy and satisfy growing rubber demand in a sustainable way. Entry: Shapeways' PA11, which is derived from castor oil and is now being made available to customers as part of the firm's expansion in to the orthosis and prosthesis market. Ana heads up the Enterprise Hub team at the Royal Academy of Engineering supporting technology entrepreneurs on their journey of setting up and growing innovative engineering companies. Dr Tom Beale has a background in medical device development. Prior to joining CPI, Tom worked in the NHS developing medical devices for commercial exploitation, working on multiple projects from point-of-care diagnostic devices, to implantable brain simulators. Mark is responsible for Health Economics and Market Access for EMEA where he leads teams based in most European countries dealing with reimbursement and market access strategies. Darren has been with Medilink East Midlands, since 2004. In his role as Chief Executive, he has successfully overseen the development of the company into one of the key players in the Medilink UK network. Leigh Cornock has a PhD in Electronic System Engineering from the University of Essex and has been working in industry on electronic product research and development for 15 years, with over 13 years focused on medical device development. Laura Hughes is the Editor of both the European and North American issues of the Medical Plastics News magazine. She has spent her entire career to date working within medical publishing; more recently specialising in the areas of cardiology and ophthalmology. “The standard of the entries for these five categories is testament to the enthusiasm and passion that exists within the medical device engineering community. The Med-Tech Innovation categories will be announced during the Medilink UK Healthcare Business awards ceremony and gala dinner. The evening will be hosted by best-selling author and comedian Adam Kay, author of This is Going to Hurt, his “hilarious and heartbreaking” (Charlie Brooker), “blisteringly funny” (Jo Brand) memoirs from his former career as a junior doctor was published by Picador in September 2017. It received across-the-board critical acclaim and entered the Sunday Times best-seller list at number three. TV and film rights for the book have been sold and the book is being translated into eight languages. The ceremony will take place 15th May 2019, at the National Conference Centre, Birmingham, in conjunction with Med-Tech Innovation Expo. To book tickets to attend this prestigious evening, click here.